Properties in Mountain Thunder Lodge average 4.5 out of 5 stars. Luxury Ski in Unit in the Heart of Breckenridge. On Call Shuttle To Gondola. Property 12: Luxury Ski in Unit in the Heart of Breckenridge. On Call Shuttle To Gondola. Ski In Gondola Out in this Fantastic Condo with Guest Shuttle and Walk to Main! Property 19: Ski In Gondola Out in this Fantastic Condo with Guest Shuttle and Walk to Main! 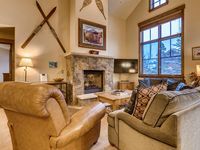 Mountain Thunder Lodge Ski-In/Gondola-Out Luxury Condo near Main Street! Property 30: Mountain Thunder Lodge Ski-In/Gondola-Out Luxury Condo near Main Street! Mountain Thunder Lodge 305-New Listing! Property 35: Mountain Thunder Lodge 305-New Listing! The Perfect 2 Bedroom Condo for Your Ski Getaway! Comfy and Cozy! Property 43: The Perfect 2 Bedroom Condo for Your Ski Getaway! Comfy and Cozy! Charming Mountain Condo - A Perfect Ski Vacation Retreat! Property 44: Charming Mountain Condo - A Perfect Ski Vacation Retreat! Cozy Studio Condo with Gas Fireplace Perfect for a Couple's Retreat! Property 45: Cozy Studio Condo with Gas Fireplace Perfect for a Couple's Retreat! Charming and Spacious 2 Bedroom Townhome for Your Perfect Ski Getaway! Property 50: Charming and Spacious 2 Bedroom Townhome for Your Perfect Ski Getaway! This unit is in Building 6 of Mountain Thunder Lodge. It&rsquo;s a one-story condominium on the first floor. There are many nice things about this rental, so first a list of those: the location is excellent! It is across the street from the gondola with tunnel access under the street, and a ski-in location down the four o&rsquo;clock run to the gondola offshoot right into the back of the unit. The kitchen is well equipped (Keurig! ), the mattresses have been recently replaced, wireless is reliable and fast, and each room has a large flat-screen TV. MTL also runs a shuttle that provides regular, prompt, and friendly service to virtually anywhere you want to go. But this is not a five-star rental for several reasons. There were small things like the towels and hangers which were the type you&rsquo;d find in a cheap motel. The towels were thin and tiny and the hangers were not removable from the closet, assuming you could even find hangers since the front closet had none. The garage is barely large enough to hold our midsize SUV and the driveway is shared with the unit next door making It hard for us to squeeze our car in next to theirs. But the biggest reason this isn&rsquo;t a five star rental is the NOISE. It&rsquo;s NOT a town home, it&rsquo;s a condominium, and that created issues. We had rented expecting a town home as was advertised. By definition, town homes have adjacent walls but not adjacent floors. We specifically rented a town home expecting to avoid neighbors overhead. However, there is a floor above this unit and the upstairs neighbors were quite noisy and clomped over our heads. Even worse, the patio for the unit next door is adjacent to the master bedroom windows and very close to the patio for the unit we rented, so when our neighbors went outside several times a day including in the wee hours of the morning to smoke weed, the noise and odor were overwhelming. At one AM we tried calling the front desk and no one answered...so we finally went outside and confronted the neighbors ourselves. Even with the windows closed, we could smell and hear everything next door and overhead. This rental should be advertised as a condominium, and the price is too high for the configuration of the floor plan and adjacency to the noisiest oarts of the neighboring unit. I considered giving it three stars but the location and shuttle service are four-star amenities. Loved the townhome and the ease of access to the mountain and town. We found the rental organization to be easy to work with and very responsive. Plan on staying here again next time we&rsquo;re in town.